It has now been twice in my lifetime that I’ve seen gorgeous sunsets on beautiful beaches that really blew my mind and I’ve failed to capture both on film. In both situations, I arrived on a new beach in South East Asia and went for a walk on the beach after a long day of traveling. As I walked, the sun started to set and the sky started to turn red . .
I’m enjoying the end of a long day and anticipating tomorrow’s day of relaxation when all of a sudden the sunset decides to get real on me. The sky is no longer simply a deepening red on the horizon of blue. Now it’s developed a full rainbow array of colors: from indigo purple to true blue, grassy green to golden yellow, radiant orange to ruby red. It’s surpassing all expectations I ever had for a beautiful sunset. This always happened in the last few minutes of the sun dipping below the horizon and all I could ever do was stop and enjoy it from where I stood. It was always my first day on the beach and I didn’t have my camera on me. Between the knowledge that if I made a run for my camera I’d surely miss the best part and the expectation that sunsets must be this beautiful in paradise every night, I just enjoyed the moments and planned to capture the next day’s repeat performance on film. This has happened to me twice. 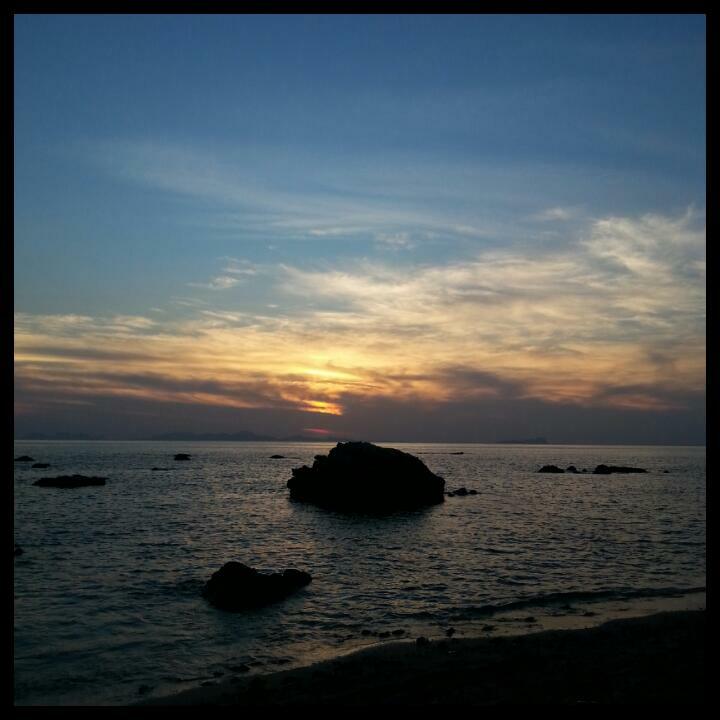 Once on Otres beach in Cambodia and once on Koh Pu beach in Thailand and in both cases I was not treated to the same beautiful sunset again during the reminder of my stay! There is something magical about a sunset so beautiful. Both beaches followed them up with gorgeous relaxing days and calm cool evenings, both beaches will forever be in my memory as real life paradises and both beaches have made my short list of places to revisit. I’ve yet to capture a sunset that magical on film, but I hope to someday. South East Asia is truly a magical place. What magical moments have you experienced in Asia?